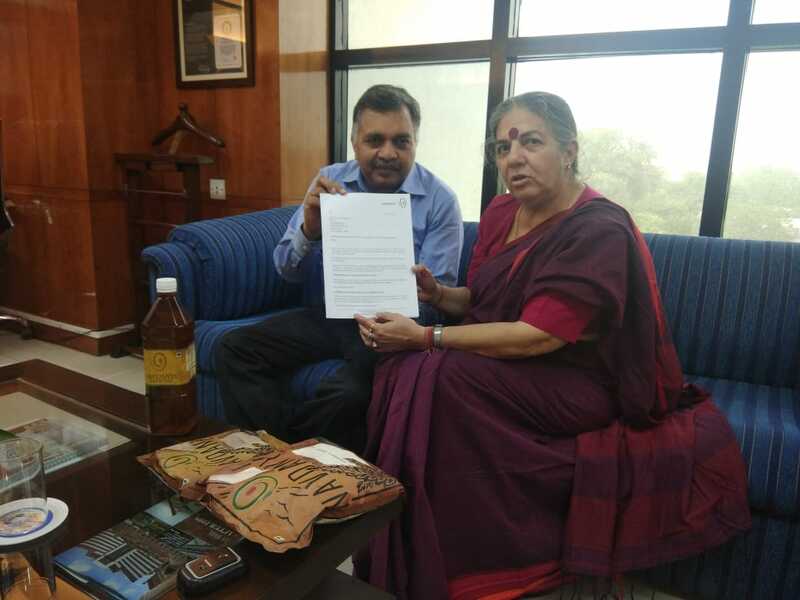 New Delhi, June 13, 2018: Dr Vandana Shiva, founder-director of Research Foundation for Science, Technology and Environment (RFSTE) met with CEO Food Safety and Standards Authority of India (FSSAI), Pawan Agarwal on Wednesday to express concerns about the 5% genetically modified(GM) labelling. The Food Safety and Standards (Labelling and Display) Regulations, 2018 draft had been released for comments by the Food Safety and Standards Authority of India (FSSAI) in April, 2018. She submitted her concern through a dossier, highlighting key problems with the proposed rule to label foods with more 5% percent GM ingredients only as GM foods. The draft Regulation introduces labelling of genetically modified (GM) food. The FSSAI has been silent on GM food in India by way of import and otherwise, and was reprimanded in the Parliamentary Standing Committee Report 301 on “GM crops and their environmental effects” for no labelling of GM foods. In the letter (here below), Dr Shiva emphasises, on “By introducing a clause that allows 5% GMOs in our food you are acting in violation of India’s laws , you are making decisions that are sub judice, are unscientific, and undemocratic. And by allowing 5% GMOs in our food to not be labelled, i.e. seen as GMO free by consumers, you are misleading Indians about what they are eating, and denying them the Right to Know what is in their food. Further you are even going against international standards that do not allow more than 1% GMO’s. Dr Shiva also has addressed the same letter to Prime Minister Narendra Modi, and given a call to 10 millions strong Mahila Anna Swaraj network of women producers, women farmers etc and small farmers, tribals , artisanal producers and those upholding food heritage of good and safe food to petition against this step which threatens India’s food and health security. In response to her call, thousands from India have already signed the petition supporting Dr Shiva. The letter calls on government to “create an independent commission on Food and Health with women and mothers, consumers , Ayurvedic experts, public health experts, doctors , nutritionists , artisanal producers to organise public hearing to frame the direction of the future of food for health in India. Explore more sophisticated labelling that is based on the process of production and related to health rights of consumers instead of misleading reductionist labelling designed only to expand markets and profits for the fake food, junk food industry and MNCs. Do an interdisciplinary and multi stakeholder assessment by of the social and ecological impacts if your draft is implemented , including the increase of plastic and aluminium waste and garbage . What would the impact be on increasing the unemployment crisis, the chronic disease crisis , and the garbage problem. Swachh Bharat is based Swachh Bhojan , on food that healthy and fresh and local ,free of pesticides and untested chemicals . For any more questions please contact Indra Shekhar Singh 9910589956. India is a land of fresh , healthy , diverse food traditions guided by 5000 years of Ayurveda, the science of life, the science of eating good, diverse food for a healthy life. Food is Sarvaaushadi . The labelling rules you have framed are anti national, anti public health, anti science, anti democracy. They are anti national because you are working against the order public in the context of food in India.You are legalising that which is illegal, and criminalising our indigenous and healthy food cultures and local economies. For example ,you are trying to introduce GMOs in our diets through the backdoor, even though growing and importing GMOs is not allowed in India. No Comments to "Anna Swaraj: Movement to Stop Misleading & Unscientific Labelling Law that will Destroy India with Fake Food"